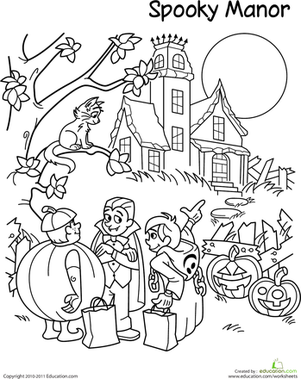 Help your child celebrate Halloween with this spooky Halloween scene. 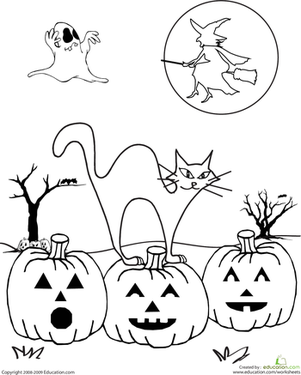 This coloring page features jack o' lanterns, cats, witches and ghosts—everything you've come to expect from a Halloween night! 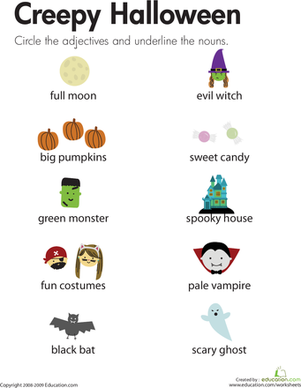 Go on a spooky hunt for Halloween words! Just get out your pencil and start circling. How fast can you complete this Halloween challenge? 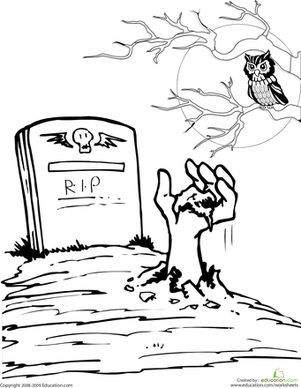 This scary Halloween coloring page features a hand emerging from a grave. Help your kid get into the Halloween spirit, with this spooky manor scene. Your child will solve these Halloween word problems for some spooky maths and reading practise. Help your little ghost or ghoul have fun with Halloween maths. What better way to prepare for Halloween than with a spooky crossword puzzle? Your second grader will use creepy clues to fill in the puzzle. After students read, they’ll make the picture in their minds come to life by drawing their favorite scene and quoting a passage from the text. Solve spooky equations with this Halloween word problems sheet! Your child will be honing his reading as he works on simple addition and subtraction problems.